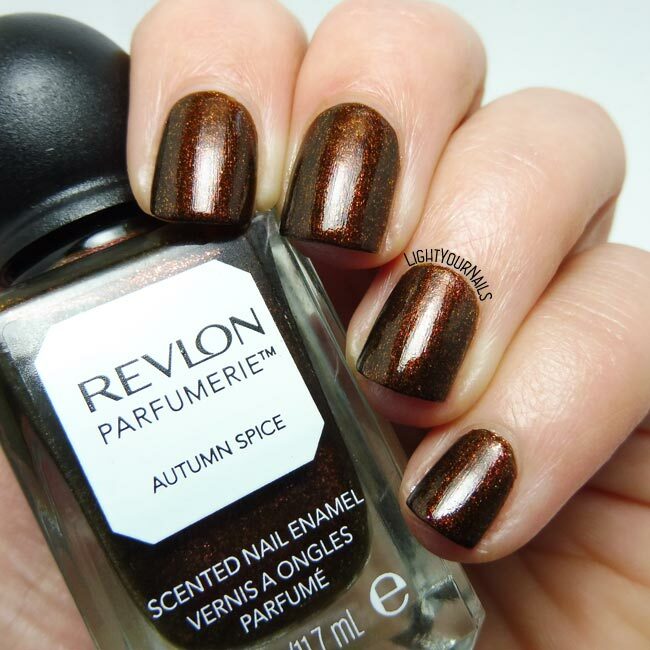 Revlon Parfumerie Autumn Spice | Light Your Nails! After a pink week I went for a more Fall appropriate shade. I don’t even know if this scented nail polish range by Revlon still exists honestly. Anyway I fell in love with the vintage shaped bottles when it was released and I purchased three back then. I used one almost immediately, Revlon Parfumerie Italian Leather, loved the colour but not the formula. And then I forgot the other two until the other day. 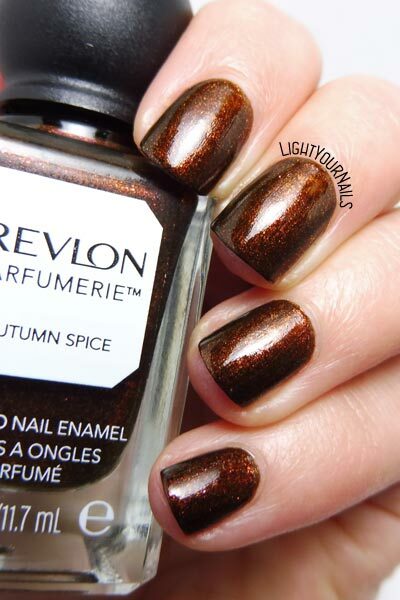 This time I picked Revlon Parfumerie Autumn Spice, a shimmery brown leaning burgundy. The scent is more delicate than the one in Italian Leather which was really strong. Anyhow I think I can smell cinnamon, which might well be given the name of this polish. Application was easier than the other one, it’s not very opaque at first coat but perfect with a second one. Drying time is quick and the finish is glossy, I actually noticed no difference between before and after top coat. I see it’s a gorgeous shade but somehow I couldn’t really fall in love with it. Maybe there was a reason why I forgot it in a drawer! Have you ever used scented nail polish? What’s your opinion about it? Questi di Revlon invece hanno un profumo che dura per giorni, anche col top coat! Non me lo ricordo quello verde! Prima o poi dovremmo fare un mega meeting di scambi! Ciao simo! Questa collezione me la sono persa ma ricordo che presi uno smalto profumato di loro era un verde lime, molto bello! Probabilmente avevo aspettative troppo grandi su questo smalto e son rimasta delusa per quello, non lo so! I don't see any sense in scented polish, but as far as colour goes, this one is gorgeous. Sometimes it's nice to have nails that smell good but yeah, not a big deal!